In post-war Japan, itinerant actors were rather closer to the bottom of the social ladder than the top. Considered little more than homeless tramps under the best of circumstances, this essentially becomes the reality for a traditional company stranded in a Japanese seaside village. Yet, for one veteran thespian, long neglected family matters become more pressing in Yasujiro Ozu’s Floating Weeds, which screens at The Japan Society and MOMA as part of their Kazuo Miyagawa: Japan’s Greatest Cinematographer series. If anything, the economic prospects for a troupe like Komajuro Arashi’s have only gotten worse since 1934, when Ozu first told the story of the high and dry actors in his silent feature A Story of Floating Weeds. For a self-consciously modernizing society, Arashi’s productions seem distinctly old-fashioned. Patrons simply are not coming, except for a handful of old faithful, including Oyoshi, a single mother with whom he has a bit of history. Her son Kiyoshi knows Arashi as “Uncle,” but he is really the young man’s father. When the company manager absconds with the meager receipts, at least it affords Arashi some time to spend with Oyoshi and his son. Unfortunately, this inflames the jealousy of his lover Sumiko. Out of spite, she bribes her sexpot colleague Kayo to lead on Kiyoshi and then cruelly dump him. Of course, unforeseen complications arise when the actress falls for her prey. Like Kurosawa and Masumura, Ozu used a regular stable of actors in his films, in both lead and supporting roles. Frequently appearing as meddling aunts and gossipy family friends, Haruko Sugimura has one of her fullest, most sympathetic roles as a member unofficial Ozu repertory playing Oyoshi. Warm and nurturing, but all too conscious of the difficult nature of life, she is a quintessentially Ozu character. By contrast, the seductive Kayo is not exactly Ozu-ian, though Ayako Wakao was no stranger to sexually charged roles. However, she brings a sort of innocence to Kayo that is ultimately endearing. 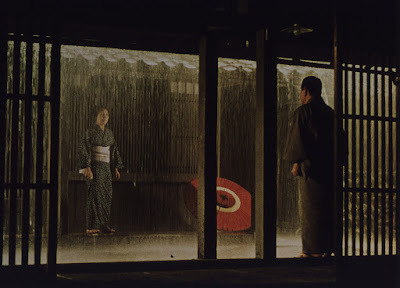 In the nominal lead, Ganjiro Nakamura holds it all together effectively enough as the gruff but deeply flawed Arashi. Clearly acclimating to color cinematography, Ozu’s transitional beach and seaside shots have a burnished glow befitting his trademark style. Bittersweet and forgiving, it is yet another classic example of his deeply humanistic filmmaking.